Make the most of ApiRTC! Acquire the fundamentals of WebRTC architecture, protocols and associated software technologies. Understand WebRTC by theoretical analyzes of varied use-cases, and experimental work on platform. Get an introduction to its potential in term of new services. WebRTC is a project initiated by the W3C and the IETF, whose objective is to achieve real-time mutimedia communications between web browsers. By introducing a native convergence of synchronous/asynchronous communication services, landline/ mobile, voice/data... This new approach made the web the natural support and definitively any professional or public communication service. Computer and/or network engineers, developers of telecommunications services, web developers, technical managers. This part of the training includes practical work on platform for use-case analysis and development of a service. 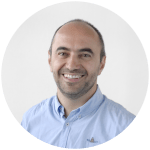 CTO and co-founder of Apizee, Frederic has a large experience delivering VoIP systems for telecom carriers and is an established expert in WebRTC technology and WebRTC based multimedia applications development.